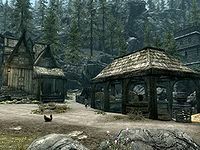 Solitude Stables is the stable serving the city of Solitude. 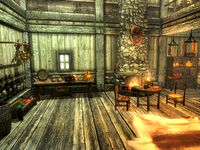 Located at Katla's Farm, a horse can be bought from Geimund for 1000 gold. If Geimund dies, Horm will instead sell you the stables' horses. The stables use the north end of the yard shared with Katla's farm. There are three steps up to the front door, which isn't locked during the day. Most of the plants and mushrooms can be found against the walls of either the building or stables. There are many barrels of food in the yard. On your left when entering is an open crate against the southeast wall containing containing five red apples, three potatoes, and two cabbages. Above this is a rack holding two elves ears, a garlic braid and a bunch of frost mirriam. There is a table against the southwest wall holding two potatoes, a haunch of venison, several cheese wheels and wedges, a baked potato, a seared slaughterfish, a salmon steak, a pheasant breast and several loaves of bread. Under the table is an open crate containing a sample of fly amanita, a gourd, a rock warbler egg, and an orange dartwing. To the right is a fireplace with a cooking pot in front. On the hearth is a piece of raw beef, a haunch of venison and a cabbage in a cast iron pot. There is a round wooden table and two chairs in the middle of the room holding a loaf of bread. There are two racks hanging from the ceiling holding four rabbits and two salmon. To the right of the fireplace is a cupboard holding four tomatoes, two sweet rolls, several loaves of bread a haunch of venison, a bottle of alto wine, a couple of cheese wheels, and an eidar cheese wedge. To the northwest is a doorway to a bedroom, with a stack of three barrels between the cupboard and doorway. Against the northeast wall is a small unit holding a woodcutter's axe and a wall shelf holding various cups, goblets and plates. Also against this wall is the staircase leading to the top floor. Under the stairs is a cupboard holding an iron helmet and a couple of sacks. To the left is a set of shelves holding several cheese wheels, three cabbages, three potatoes and a potion of regeneration. To the left of this is a second bedroom containing an unowned single bed in the northern corner, with an unlocked chest at the foot of the bed. To the left of the bed is an end table holding a common book. In the southern corner of the room is a stack of three more barrels. The first bedroom contains a single bed in the western corner with an end table to the right. At the top of the stairs, against the northwest wall, is a small unit holding a selection of iron, steel, and silver ingots and a sack. To the left is a small table and two chairs. On the table is the business ledger and a leveled locked strongbox containing a considerable amount of gold and a steel ingot. The upstairs only extends halfway across the building, with a railing around the edge. Against the railing is an unowned single bed with an end table to the right and an unlocked chest at the foot of the bed. One stone quarryHF can be found behind the goat pen. This page was last modified on 10 December 2017, at 19:51.